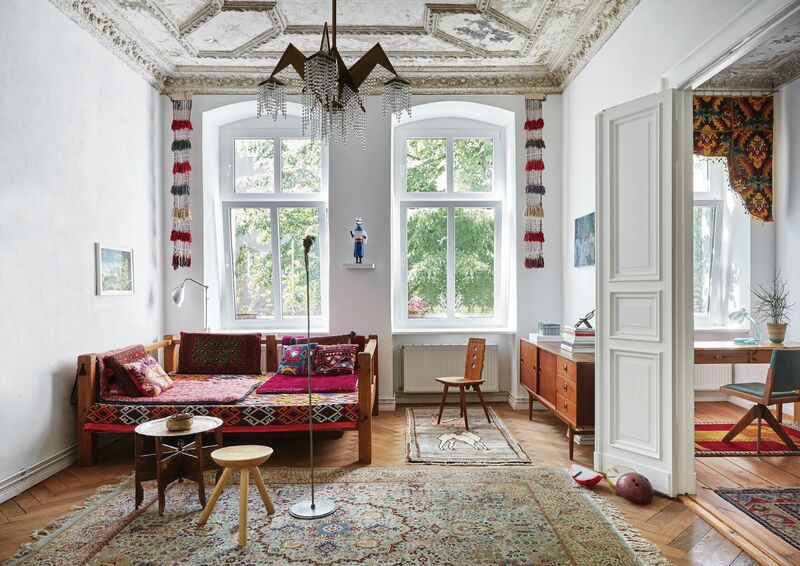 An ornately carved Moroccan door leads through the large Berliner Zimmer —a spacious room connecting the front and back houses—to the bedroom in Kasia Korczak and Payam Sharifi’s apartment in a classic Gründerzeitwohnung (Industrial Era building) in Moabit, an inner city locality of Berlin. Sharifi says that, when the door is closed, it has a tromp l’oeil effect: guests often don’t realise that it’s a real door. “Because it doesn’t fit in with that environment—there’s this traditional Moroccan door squeezed into a 19th-century house—[they assume that] it’s a sculpture or a wall piece,” he says. “They don’t think it opens up.” But it does, and it has a curious psychological impact. “There’s an ‘Open Sesame’ effect of opening an old wooden door, as opposed to a modern door, which makes the passage into the bedroom more pronounced, separating the private space from the more public realm of the home,” he says. Prior to renovating the apartment, Korczak had already decided to include the door in the plans. As their architect Marc Benjamin Drewes, who worked in collaboration with German design firm Schneider Oelsen, recalls, “The first time we walked into the space, it was already lying on the floor.” He freely admits that he would never have been bold enough to include it in a renovation, but loves its effect. Finding this apartment and moving in wasa significant turning point for Korczak and Sharifi. As co-founders of the art collective Slavs and Tatars, they and the other members of the collective had practiced apart, dotted across different cities around the world since they formed in 2006. Sharifi is an American-Iranian writer, researcher, and artist from Texas who has lived and worked in London, New York, Paris, Moscow, and Tehran. Korczak, originally from Łódz, in central Poland, has lived, worked, and studied in London, Arnhem, and Brussels. “It was essentially the first time we were both in the same city as a collective, so it was the first time we had a home and a studio,” says Sharifi. Their current neighbourhood, Berlin Moabit, is situated slightly north of the city centre, near Tiergarten and the Reichstag. It was in the former West Berlin, but has working-class roots and was among the last neighbourhoods to gentrify. “It’s a microcosm of the whole of Berlin: most of the city is pretty communitarian, but here you have Germans, Turks, Africans, Arabs, and Eastern Europeans all within half a square kilometre,” says Sharifi. The working-class roots of the area made the features of the apartment they found all the more exciting. “It had many original materials, and really extensive moulding on the ceilings,” says Drewes. “You don’t see that so much.” He thought of it as a diamond in the rough. The 19th century Gründerzeit origins of the building were interesting to Korczak and Sharifi in terms of their artistic practice, too. Part of reason they formed Slavs and Tatars was to envision an alternative idea of modernity that does not so much rupture with the past as innovate within a tradition. Not only was the anonymous craftsmanship embodied in the ceiling mouldings an example of the kind of craft-based practice that they like to reconnect with in their own work, but it also evoked a pre-modern world view that many cultures have in common. “Of course, modernity has made ceilings blank slates,” says Sharifi. “But, until the turn of the 20th century, people around the world invested their wealth in their ceilings.” From the wood carvings in middle European medieval houses to the Muslim world, ceilings were clad with “a certain indulgence of assets” as Sharifi puts it. “A [beautiful] ceiling elevates you, it makes you look up like you do in a cathedral. Modernity re-centred that gaze towards the individual and this world and not the next world,” says Sharifi. “You’re always looking at eye level or down, at the floors.” He found the effect of the ornate “pre-modern ceiling, where you can see a relative amount of wealth for a working class neighbourhood” intriguing, and he and Korczak saw its potential to allow life and their artistic practice to dovetail. For the most part, rather than altering the apartment, the renovation involved bringing out its inherent qualities. “The task was not to destroy anything,” says Drewes. The moulding on the ceilings in three of the rooms, for example, had been painted and repainted so many times over the past century that much of the detail had been obscured. A lot of time and effort went into painstakingly shaving off the layers of paint by hand. “We didn’t know in the beginning how long it would take,” says Drewes. The rest of the restoration involved sanding the old oak parquet and the wooden boards and treating them with a mixture of oil and wax. The doors were stripped and repainted, too, and the walls plastered with a simple roughly textured lime cement. The floors in these new areas are tiled with patterned untreated cement tiles, prompted by the Moroccan door, which also impart a particular atmosphere to these areas of the apartment. They offset the pristine modernity of the new areas, and Sharifi notes how they “breathe” and cool these areas without making it necessary to open a window in the bedroom, for example, which would create a draft. From the anonymous craftsmanship of the ceiling mouldings to the furnishings and decorative elements that are drawn from the artisanal traditions of Poland and Iran, given Korczak and Sharifi’s backgrounds, the design is collective and inclusive rather than intended to impress anyone or display the owners’ status and aspirations. Similarly, the Polish mountain chairs from the village of Zakopane in the Tatra mountains, not far from Krakow, represent an early 20th century national movement, not unlike the Art and Crafts movement in England, in which “urban Poles and intellectuals moved to the countryside to rediscover what is quintessentially Polish”. “It became a kind of cult creative getaway, almost the 19th century or early 20th century equivalent of Santa Fe or Marfa, in Texas,” says Sharifi. The three-legged stools from Romania are a simpler vernacular handcrafted design. At the same time, there are a number of mid-century Polish pieces, many inherited from Korczak’s family. And one of Sharifi’s favourite pieces is a pre-1914 cubist chandelier by Czech Josef Gocár. “It is a rare example of a principle of the fine arts being applied to one of the applied arts,” he says. The significance of the carpets throughout the apartment is another exploration into the possibilities of handcrafts. The artists often collaborate with craftsmen from Turkey, Iran, and Poland to create rugs and carpets for their own artworks and installations. They like the cultural ambiguity such materialsrepresent. “In Eastern Europe, people put carpets on the walls,” Sharifi explains. “We of course in the Middle East and the Caucuses put them on the floor. We do both in our practice.” He likes the sense of indeterminacy they create. It’s the very ambiguity, the uncertainly and even sense of conflict in certain elements throughout the apartment that create its unique sense of hospitality. It invites interaction; it invites in the anonymous craftspeople who created so many of its furnishings and features; it invites in the past and the present; it invites interpretation, and wine on the carpets. It is a very special home for Korczak and Sharifi, but a place where others might feel at home too. It’s a uniquely wonderful space that builds bridges. Originally published in the latest Philippine Tatler Homes, which is now available in all leading newsstands and bookstores, and downloadable via Magzter, Zinio, or PressReader.